Renegade Parts Washers top quality Automatic and Manual Heavy Duty Aqueous Parts Washers. Choose from standard models for GENERAL REPAIR CLEANING or custom configurations for INDUSTRIAL PROCESS CLEANING. 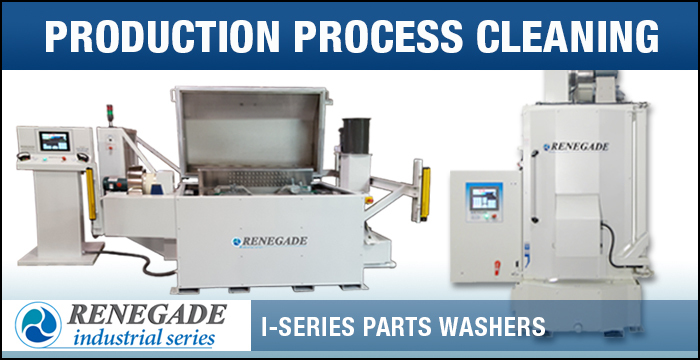 Renegade Parts Washers offers top load, front load, pass-through, and custom parts washer systems for your industrial application. Renegade Parts Washer Detergents are solvent-free for maximum cleaning without residue buildup. Check our April Sale on Renegade TMB 5500 Automatic Parts Washer! The Renegade I-Series Industrial Parts Washers for production cleaning feature more standard options, additional custom configurations and expanded capabilities to meet your unique industrial application. Ideal for parts cleaning, performance benefits include larger capacities, round-the-clock durability and PLC integration. The Renegade I-Series automatic front load, top load and pass-through parts cleaning systems can comply with clean spec requirements. 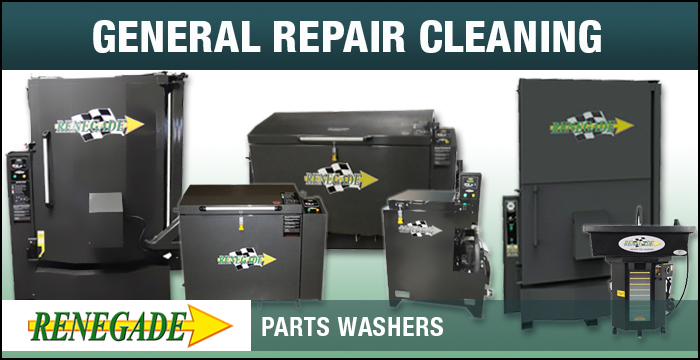 The Renegade Parts Washers standard line consists of automatic top load or front load, and manual models, with basic options for general repair “grease-busting” cleaning environments. Renegade water-based parts washers allow immersion of your parts combined with high pressure spray. The top load TMB series or front load FL series of economical aqueous part washers eliminate hand washing and typically are geared toward smaller parts with more batches, or lighter capacity with intermittent schedule. 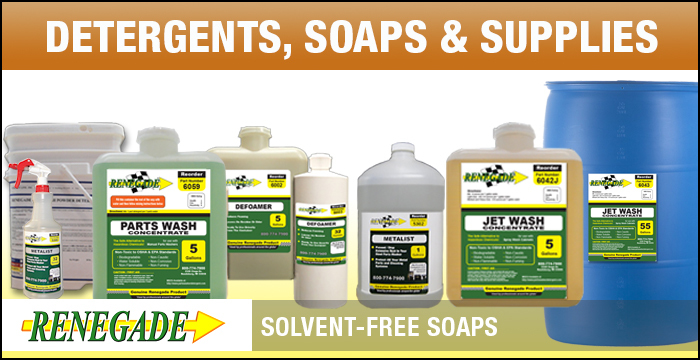 Maximize the performance of your part washing system with Renegade solvent-free soaps and detergents. Formulated to be environmentally safe and health risk free, Renegade detergents remove grease, soil, paint, corrosion, oil, and other contamination from the surfaces of different types of parts. From de-greasers, to additives, to supplies and accessories, find all your part washer needs in one place. Trying to decide on what type of aqueous cabinet parts washer is right for you? Renegade can deliver the right parts cleaning solution to comply with clean spec requirements. Renegade Parts Washers and Detergents wide range of parts washer capacities and styles. Industrial Parts Washers with custom configurations for value-added performance. Call 800-774-7900 for Clean Spec consultation. Economical part washer solution for general repair cleaning and many industrial applications. Renegade Front Load Automatic Cabinet Parts Washers use high pressure spray in a high heat environment to remove tough dirt and grease. Wide variety of sizes and load capacities. Renegade Manual Parts Washers Line are the low maintenance and cost effective solvent-free solution to upgrade from hand washing. Renegade I-Series Industrial Parts Washers feature expanded capabilities and customizable configurations designed for your unique industrial production cleaning requirements. Renegade offers clean specification consulting services to increase your industrial grade part washing performance. The Renegade I-Series Industrial Line meets the growing needs of diverse industries. Value-added performance features include larger capacities, round-the-clock durability and PLC integration. Renegade I-Series Conveyor Pass Through Wash, Rinse Dry Parts Washer System delivers 3-stage continuous cleaning efficiency to clean and dry complex, multi-ported parts transported via inline conveyorized operation. Renegade Parts Washers and Detergents Since 1996.